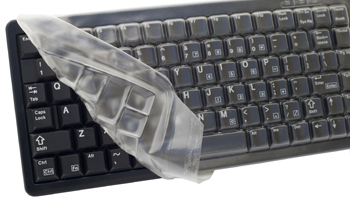 DataCal carries over 6,000 keyboard protective covers. Covers are easy to clean, especially important this flu season. Each cover is made to mold perfectly to your model of keyboard. Please call 800-223-0123 for further information or to order. Volume sale prices on ten or more covers. Please fill out "Request Information" above or call 1-800-223-0123 and a Datacal representative will contact you in 1 business day. Please include Manufacturer, Model and Part number of your keyboard cover in the comment section of the request.